Michael Graves White Ladies Witherspoon Watch is filled with subtle detail; from the matching aqua color on the crown (that which turns and sets the time), to the matching white stitching on the leather band. There is no misreading the time here. The Witherspoon Watch has large numbers with raised indexes. We love the Witherspoon Watch so much, that we now have it available in a smaller ladies size (be sure to check out the unisex size one as well), and in 2012 we introduced the Witherspoon Clock. In 2013, we introduced the Red Witherspoon Pocket Watch…and stay tuned we love Witherspoon SO MUCH…that there will be more Witherspoons to come! Michael Graves White Ladies Witherspoon Watch has black hands and a blue second hand. Michael Graves White Ladies Witherspoon Watch measures 30mm in diameter (1.15″) and 8.45mm high (0.33″). 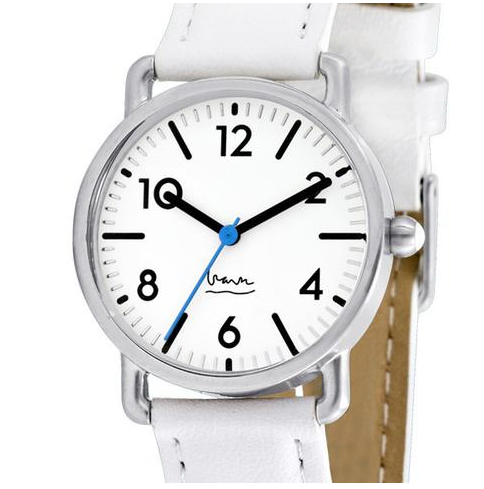 Made of stainless steel, this specially sized ladies watch is complemented by a 16mm white leather band (5/8″) with white/color stitching. or view the entire Michael Graves collection, here!